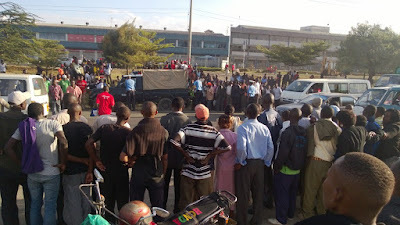 An accident scene on Mombasa Road. Last week, we were confronted with the story of a patient who spent 18 hours in an ambulance, waiting for medical care. The road accident victim, who needed Intensive Care Unit admission, found our national referral hospital - Kenyatta National Hospital, did not have any vacant ICU slot. It is said other private hospitals refused to admit the patient, though only one hospital got mentioned in the incident. Though one may be forgiven to think that this was just a single occurrence - the feeling is that the situation occurs quite often, and that the case here only happened to stand out by making it to the newspapers. Kenyans are outraged. They feel that hospitals, especially private ones, that refuse to admit patients before a payment deposit is made, are being greedy. They feel that such hospitals should not be driven by pursuit of money, and instead, should offer treatment first, then pursue money later. They feel that a hospital insisting on a deposit for treatment is breaking the Hippocratic oath, and not being humane. There have been calls for stringent laws to ensure that hospitals don’t turn patients away because of inability to pay. We have been here before, and I believe there are existing guidelines or laws that direct hospitals to take in patients first, and deal with payments later. That these do not work shows that there is a problem. Furthermore, trying to reimplement the same is likely to run into the same challenges, sooner or later. I disagree with the view that hospitals are purely driven by greed. Private hospitals are just doing what is essential for their survival. I was recently discussing the same issue with a friend. He gave me two stories which allegedly took pace. A retailer at Gikomba Market was once knocked down by a car, and then driven to M.P. Shah Hospital by a good Samaritan. The family only got aware of the incident when contacted by the hospital. They did not even know who had brought their kin to the hospital. Meanwhile, they had a rising medical bill. They quickly convened a fundraising, which raised KSh. 1.2 million. The retailer’s counterparts in Gikomba market also had a fundraising that raised about 3 million shillings, which both helped clear a huge portion of the patient’s bill. He then gave me another tale of a patient who had been admitted at a Metropolitan Hospital. On noticing the patient’s conditions was deteriorating, the family requested the hospital to transfer the patient to Kenyatta National Hospital, and that they would settle the bill later. The hospital agreed and duly ferried the patient to KNH in their ambulance. Metropolitan Hospital later called the family to follow up on their payment. This wasn't made, and further efforts by the hospital to follow up on the matter saw the contact they had eventually permanently switch off the phone - leaving the hospital with no way to contact the patient’s family. The tale would have ended there, had the hospital’s employee not been reading the papers on a given day. In the obituary section, they spotted the runaway patient, and noted a burial date had been set at Langata Cemetery. He turned up for the funeral, and reminded the grieving family of their obligations. For most of us, we picture that most scenarios tend to fall in the former one, with happy endings. That though may not be the case. A visit to Langata Cemetery will indicate that there is a large section reserved for the unclaimed dead. A visit to many hospitals, especially government ones, will reveal a group of abandoned patients - who long ago recovered, but have had no one to pay their bill and get them discharged. It is therefore quite common for Kenyans to abandon their kin in hospitals when faced with high bills. Hospital admission does not come cheap. Admission to intensive care in any hospital will set you back at more than what it costs for a stay at top Kenyan hotels. Given how many Kenyans can even afford a cup of tea in these hotels, try picture the same faced with such bills. At the same time, a high accident rate and unaffordable health care in Kenya means most of us are likely to find ourselves in a hospital bed. For a good number of us, this involves been taken to hospital by strangers in some state of unconsciousness. You therefore understand our uneasiness at the prospect of a hospital refusing to admit us because we can’t cough up huge deposits. The state of healthcare in the country means that most public hospitals lack enough resources - especially bed spaces, or medical supplies, to take in critically ill/injured patients. Years of under investment in public healthcare have taken their toll. In fact, we are lucky that the emergence of charity ambulance services - the likes of Kenya Red Cross, St. John and Swift, among others, mean that there is a better chance we may get to hospital in time. Some local governments have also invested in their own ambulance services - but these tend to be described as mere public service transport vehicles for the ill. Many lack the resources needed to sustain a patient on the balance of life and death - bar the ones I mentioned earlier. Private hospitals are in a better position compared to public hospitals. They however, are reluctant to take in patients without proof that their bills can be catered for. You see, the reasons private hospitals are in a better position is that they have been investing in facilities, resources and supplies. Some have taken huge loans to invest in expensive medical machinery. Such institutions can find themselves unable to pay their bills if a small number of patients default on their bills. Their options would be to load such bills on everyone else - thus becoming more unaffordable, or to shut down. Our options then are to either ensure that public hospitals have enough emergency capacity, or ensure that private hospitals get paid for their kind deeds. Even better, we need to come up with a way of paying hospitals for emergency healthcare patients that they take in -be they private or public. You see, even public hospitals have costs, and under investment is what has left many of them unable to admit critically ill patients. Operating theatres and ICUs are expensive to run. If we have the resources to bail out sugar factories and airlines - I do believe we can allocate money for the health of Kenyans. If we have money to build a railway, we should have enough to ensure that Kenyans are healthy enough to use one. One way in which this can be done is by having the National Hospital Insurance Fund (NHIF) take up the role of funding such cases. After all, what is the role of a Government owned medical fund, if the people can’t get admitted when ill. NHIF, can for example, guarantee to cover at least 2 days of emergency admission in a number of private hospitals. By the second day, it should be hoped that the patient can then be transferred to a more affordable government owned institution like KNH, or if able, have figured out a way to continue their stay at the institution that took them in. Alternatively, the government can set out a bail out fund that will directly go to hospitals that had to take in patients, who in turn couldn’t afford the bills in such hospitals. Such a fund may present some challenges in administering - but I believe that it can be done. Either way, we have options besides calling hospitals greedy. We need these hospitals in the future, and thus must ensure they are able to not only offer medical care, but also pay expenses they incur in the process. These are what I’d call stop gap measures, which can be implemented for now. In the long term, I believe a permanent cure of our ailing hospitals would be a basic insurance scheme for all, subsidised by government for the poor. Such as scheme should entail the doing away with of the NHIF, or privatisation of the institution. That though, is the subject of another post. Meanwhile, to get life saving healthcare for all, we have a larger part to play beyond just passing laws. We need to dip into our pockets and back those laws up.